Addis Ababa, though only nine degrees north of the equator, is cool and sunny and meant to be our ‘resting place’ before we hit the mountain monasteries of the north and the bull-jumping and lip-plated Mursis of the south. We have only one day here, and our guide, the very young and very adorable Jermias, has set up an easy day of museums and churches. Instead we opt for the market. The market of any city is the place to see the most activity, and the biggest mix of people. Addis’s Mercato is huge – and a notorious home for pickpockets. Jermias arranges for two armed men in uniform (I don’t think they are quite police) to go with us as we prowl. It’s chaotic and confusing, street after street of little tin structures. One whole street is dedicated to shoes, one to women’s underwear and a whole block to spices. By far the most interesting area is one corner consisting of several blocks that sells recycled goods. Now, we do recycle in the US. That means separating paper, plastic and metal from the rest of our trash and putting it in a blue box every week. What happens to it? Who knows? A truck takes it and we feel a bit smug that we have not just thrown something away. In Addis, they are serious. The captains of the local recycling industry collect everything from everywhere, dismantle into components, and make something different that is sold into another generation of usefulness. The breadth of items is daunting: best to list a few. Sandals. From old tires, of course! This was the work of a whole street. The tires come in by ‘hand,’ either rolled two at a time, or carried in a variety of arrangements. For example, I saw one man with a tire over each shoulder and two stacked around his neck. It wasn’t at all clear if or how he saw where he was walking. The treads are stripped off, the sandal cut into shape, and then sliced around the edge to insert the straps which are colorful nylon ribbons from some other source. Then the edges are nailed together. Laptop Computers. From old laptops. The components are ‘harvested’ and then reassembled into working computers. 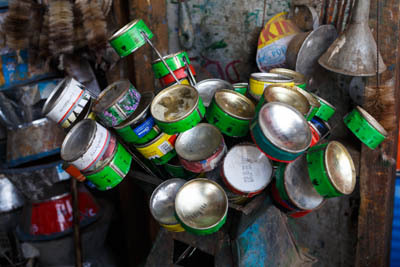 Drums from oilcans, book covers from animal skins, dipsticks from old cans of perfume, freeweights made from old gears mounted on a rod, funnels that still say ‘insecticide,’ and so on. Everything is collected, often purchased from villages for a few birr (nickels) and then repurposed. In the midst of the afternoon was a call to Islam prayer. Ethiopia is 45% Muslim and 51% Christian. Although people of both religions appear quite devout, there seems little animosity compared to other countries we have visited. Jermias just walked us through the men at prayer, and a couple of them even moved the edges of their mats aside to make it easier for us to pass. That would never have happened in Iran! !